If one were being uncharitable one might say the Londonist Music team has a certain preference for amplified guitars. So we're going to redress the balance today by introducing you all to Schmoof. Sarah and LLoyd meet the Londonist readers, Londonist readers meet Sarah and Lloyd. That's Lloyd on the left. Schmoof have been on our rader for a couple of years now, and look set to be surfacing on a few others pretty soon. The mathmeticians amongst you will have worked out that Londonist hasn't been around that long but these things don't matter in Schmoofworld. What matters are old school synths, pixelated projections, pink pvc and songs about boyfriends, chocolate and a cover of Sweet Child O' Mine that would send Axel apoplectic. It's awesome. Schmoof deal in old school electro pop, unashamed flag wavers for the eighties revival as long as it's fun, glittery and fun. Short, sharp danceable disco ditties with an eye catching stage show (not to mention the contour clutching outfits) that's been perfected through countless touring. We'll be down at The Water Rats on Thursday and if you have a spare evening you might want to join us. In the meantime jump over to the other side for the Schmoof Questionnaire, although they never mentioned the night when Lloyd bit Sarah's boss's bum. Lloyd - surf big waves around the world; search junk shops for old synthesizers. Sarah - purchase nail varnish and shoes in as many colours as possible; disco dance. Both – eat lots of chocolate. 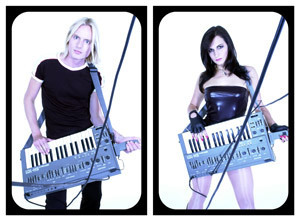 Electro-pop about the important things in life: boys, chocolate & pulling on tube trains, with a live show of pvc, heels, zx spectrum projections & frantic strap-on keyboard duels. All music is made on synthesizers from the 1970’s and 1980’s controlled by a 1985 Atari. All of our synthesizers have knobs and flashing lights and are connected together by real wires, not virtual wires. We don’t have any musicians in our band because they are too egotistical –its better with just Sarah, Lloyd and an Atari. Lloyd was in a boring indie band that played slow songs and the musicians did not move on stage. Lloyd then saw Sarah dancing in a nightclub and thought that she would move more on stage than the people in the boring indie band so Lloyd decided to be in a band with her instead. What's The State Of Play With The Band At The Moment? We’re releasing our first UK single in November 2005. What's The Big Game Plan For The Band? We would prefer if people supported us – we are difficult to follow. What's Your Ultimate Label To Be On? Sarah – a Prince after-show party @ The Astoria. He jammed with Chaka Khan and George Benson. I lost my watch. I was so astounded that Prince was just a couple of meters from me that they probably just took it off my wrist without me noticing. Lloyd – Portishead, Glasto in the rain. The rain made the music even more depressing. The musicianship was outstanding. Everyone played what they were meant to without over playing and venting their ego. They played as a band NOT as individuals showing off. Have You Ever Thrown A TV Out Of A Hotel Window? Not sure. It might prevent all our groupies from shimmying up the drainpipe to our room. Any Great Stories From The Road? Ooh lots! We did a gig at the Walkabout bar in Newquay. It was rammed full of blokes on stag nights and squaddies. Sarah wears small pvc dresses on stage. Lloyd wears tight pvc trousers on stage. We were scared. We also played at a Pie eating competition in a working men’s club in Leeds! It was brilliant. And we once played at a festival in Kingston & the a member of the Schmoof crew took off his clothes & jumped into the Thames. The security was quite tight & he was soon surrounded by police boats & officers were standing on the banks of the Thames shouting for him to come in. They asked how much he’d had to drink and he replied “not enough”. Because we’re the only electro band that rock and we use ZX Spectrums live on stage. Come to a Schmoof gig. Rowans in Finsbury Park and Finsbury Park Mosque. Driving around in our Nova convoy playing Schmoof tunes loudly on the stereo (Sarah and Lloyd both drive Vauxhall Novas) and not paying Congestion Charge. Sarah – yes, once on an actual tube train and once in a tube station. If You Could Lose One Part Of London, Which Bit Would It Be? Schmoof driving down the M3 on the way to play a Surf festival. Get a bike! If this is not possible in the early hours of the morning then hold your breath. If You Could Write A Song About London What Would It Be Called And What Kind Of Song Would It Be? We’ve written it already! Its called ‘Northern Line’ & is about pulling on the tube. If you're a band looking to get coverage in Londonist, get in touch with the music team, after reading these handy tips on How To Get Into Londonist's Music Posts.